Boston Horse aniline finished. Horse leather is very strong and durable. It is a perfect choice for leather jackets that are inteded to be used every day. Our Boston nappa is produced in Italy and comes in black only. Goat aniline finished nappa. Goat aniline is very strong and a perfect choice for leather jackets, vests and skirts. 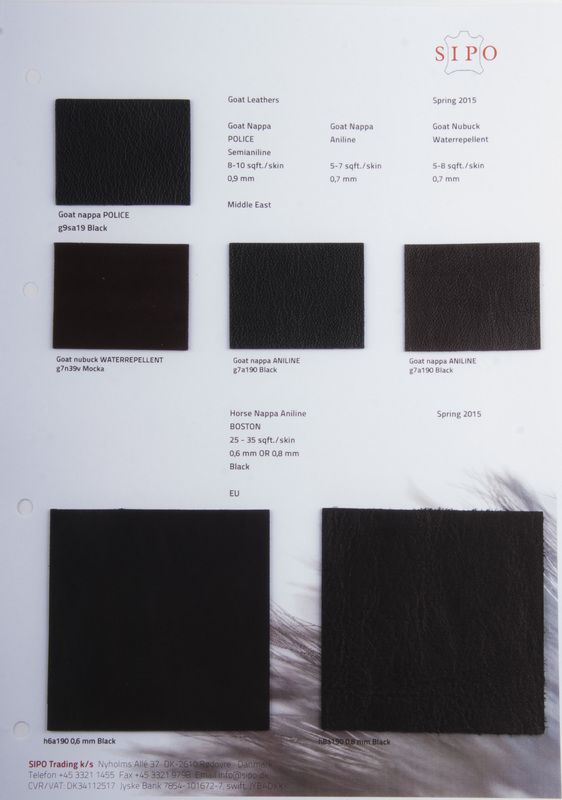 Our Goat leathers comes from Pakistan, and is made in several colors. The finish of these skins are very strong and durable. Goat semianiline POLICE is 0,9 mm and is in average 8-10 sqft./skin. This article comes in black only, but since it is a semianiline it is by far the strongest.